It's been a long while since I last posted about craft projects of my kids. That is because last school year, most of their art projects were done in school. So, I don't get the chance to take pictures of what they made. The school art projects below are those which I failed to post last year. This is Angel's project in her Grade 2 art class. She looked for 3 different sizes of empty cans. Then she cut the popsicle sticks to size and used glue gun to attach them around the cans. When dry, she decorated the pencil stands with red ribbons, butterfly and star stickers, flowers and some decorative paper. This is nice project for recycling cans. My second son did a project like this before. 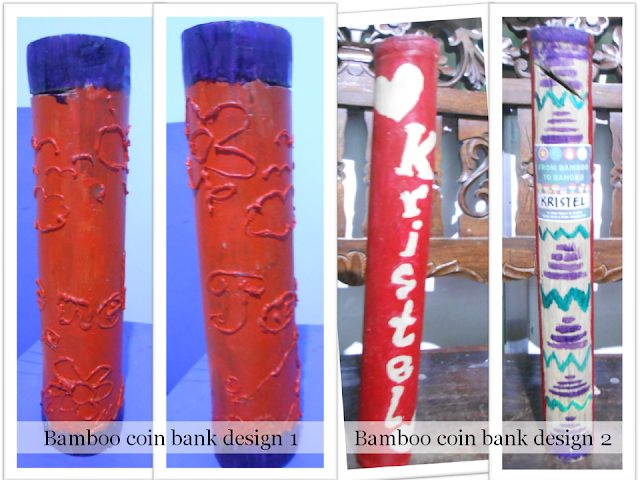 He decorated a bamboo coin bank using the technique called decoupage. You can see it here. So when the two girls were given their own bamboo coin bank to decorate, they looked for other ways to decorate their piece. The coin bank on the left side in the picture below is Janel's project. She painted her bamboo coin bank after adding some embossed designs. She used the glue gun to draw flowers and some lettering spelling her name. Afterward, she used acrylic paint to paint the bamboo. The coin bank on the right is Kristel's. On one-half of the bamboo, she made a stencil of her name and a heart out of paper, used scotch tape to stick them on the bamboo and painted the background with acrylic paint. When she removed the paper stencil, the design revealed her name and heart. On the other half of the bamboo, she used different colors of paint to draw patterns (lines and zigzags). The techniques used in designing the bamboo coin banks may be used in other recyclable items, too. You can decorate used wine bottles, jars and cans so they become beautiful decorative pieces. These are projects of Emmuel for Grade 8, I think. The photo on the left is a pawn (chess) made by carving or sculpting a candle. It may look easy to make but it's not at all. 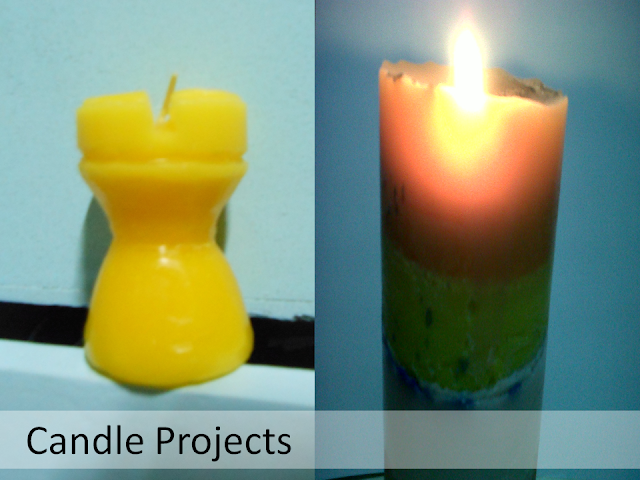 You need to be careful in using the cutter to take away parts of the candle to reveal the desired shape. Here's the procedure for making the recycled candle (if I remember it right - I just watched him do it). Melt the candle in an empty can. Tie a string in the center of a bamboo stick, then place the stick over the mouth of the Pringles canister and suspend the string at the center. Make sure the string reaches the bottom of the canister. Add pieces of crayon of one color to the melted candle until they melt. Stir the mixture. Pour the melted candle into the canister. Repeat steps 3 to 5 but use a different color of crayon. Do this 3 times or as many times as you want. When you're done and the candle is cool, remove the Pringles canister by cutting and tearing it. This is Kristel's school project. The instruction was to use recyclable materials. In order to make this decorative box, the materials include old plastic container (she used a container of Galaxy chocolates), old CDs, glue gun, and embellishments, such as beads, buttons, etc. Cut the CD into pieces with irregular shapes. Be careful as the CDs can have sharp edges. 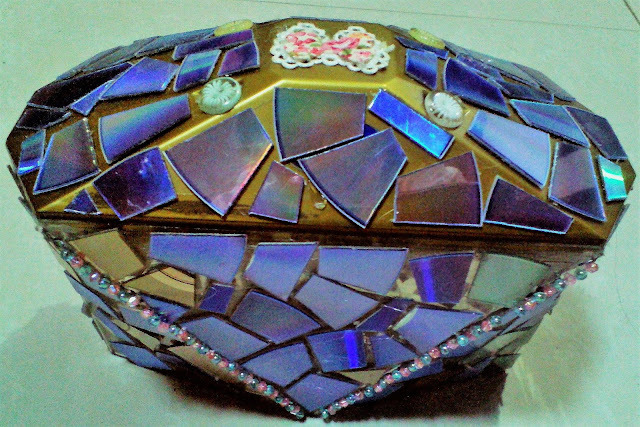 Use the glue gun to attach the CD pieces all around the container making something like a mosaic. The reflective side should be facing up. Embellish the container as desired. This decorative box is perfect as a receptacle for jewelry pieces and watches or hair accessories. It looks nice doesn't it. I hope I can post other art and craft projects next time. I will if my kids bring home some more projects from school. Nice Kids craft projects. I wanted also to share some craft projects kaya lang no time to make step by step tutorial. But hopefully soon. Great job sis! I love the popsicle cans and the candles. These are simple yet brilliant crafts. I'm not a very crafty person but every once in a while, I also do a little craft here at home. hehe. Wow, such creative projects! I've been looking for arts and crafts projects that my son and I can do for homeschool. You gave me great ideas here. Wow! So cute! I remember my school days. This is one of my favorite activities when I was a student. It's better late than never so goes the saying for you who hadn't shared your kids' works of art before. They are indeed worth sharing for they're well crafted, nice and beautiful. These will serve as a model for others who would like to have their own project. Great kids art projects. I always wanted to make candles.